Blinking numbers on a liquid-crystal display (LCD) often indicate that a device’s clock needs resetting. But in the laboratory of Zhong Lin Wang at Georgia Tech, the blinking number on a small LCD signals the success of a five-year effort to power conventional electronic devices with nanoscale generators that harvest mechanical energy from the environment using an array of tiny nanowires. In this case, the mechanical energy comes from compressing a nanogenerator between two fingers, but it could also come from a heartbeat, the pounding of a hiker’s shoe on a trail, the rustling of a shirt, or the vibration of a heavy machine. While these nanogenerators will never produce large amounts of electricity for conventional purposes, they could be used to power nanoscale and microscale devices — and even to recharge pacemakers or iPods. Wang’s nanogenerators rely on the piezoelectric effect seen in crystalline materials such as zinc oxide, in which an electric charge potential is created when structures made from the material are flexed or compressed. By capturing and combining the charges from millions of these nanoscale zinc oxide wires, Wang and his research team can produce as much as three volts — and up to 300 nanoamps. Recent improvements in the nanogenerators, including a simpler fabrication technique, were reported online last week in the journal Nano Letters. Earlier papers in the same journal and in Nature Communications reported other advances for the work, which has been supported by the Defense Advanced Research Projects Agency (DARPA), the U.S. Department of Energy, the U.S. Air Force, and the National Science Foundation. The earliest zinc oxide nanogenerators used arrays of nanowires grown on a rigid substrate and topped with a metal electrode. Later versions embedded both ends of the nanowires in polymer and produced power by simple flexing. Regardless of the configuration, the devices required careful growth of the nanowire arrays and painstaking assembly. In the latest paper, Wang and his group members Youfan Hu, Yan Zhang, Chen Xu, Guang Zhu and Zetang Li reported on much simpler fabrication techniques. First, they grew arrays of a new type of nanowire that has a conical shape. These wires were cut from their growth substrate and placed into an alcohol solution. The solution containing the nanowires was then dripped onto a thin metal electrode and a sheet of flexible polymer film. After the alcohol was allowed to dry, another layer was created. Multiple nanowire/polymer layers were built up into a kind of composite, using a process that Wang believes could be scaled up to industrial production. When flexed, these nanowire sandwiches — which are about two centimeters by 1.5 centimeters — generated enough power to drive a commercial display borrowed from a pocket calculator. Wang says the nanogenerators are now close to producing enough current for a self-powered system that might monitor the environment for a toxic gas, for instance, then broadcast a warning. The system would include capacitors able to store up the small charges until enough power was available to send out a burst of data. 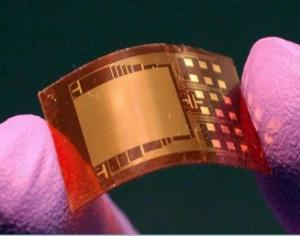 While even the current nanogenerator output remains below the level required for such devices as iPods or cardiac pacemakers, Wang believes those levels will be reached within three to five years. The current nanogenerator, he notes, is nearly 100 times more powerful than what his group had developed just a year ago. Writing in a separate paper published in October in the journal Nature Communications, group members Sheng Xu, Benjamin J. Hansen and Wang reported on a new technique for fabricating piezoelectric nanowires from lead zirconate titanate — also known as PZT. The material is already used industrially, but is difficult to grow because it requires temperatures of 650 degrees Celsius. In the paper, Wang’s team reported the first chemical epitaxial growth of vertically-aligned single-crystal nanowire arrays of PZT on a variety of conductive and non-conductive substrates. They used a process known as hydrothermal decomposition, which took place at just 230 degrees Celsius. With a rectifying circuit to convert alternating current to direct current, the researchers used the PZT nanogenerators to power a commercial laser diode, demonstrating an alternative materials system for Wang’s nanogenerator family. “This allows us the flexibility of choosing the best material and process for the given need, although the performance of PZT is not as good as zinc oxide for power generation,” he explained. And in another paper published in Nano Letters, Wang and group members Guang Zhu, Rusen Yang and Sihong Wang reported on yet another advance boosting nanogenerator output. Their approach, called “scalable sweeping printing,” includes a two-step process of (1) transferring vertically-aligned zinc oxide nanowires to a polymer receiving substrate to form horizontal arrays and (2) applying parallel strip electrodes to connect all of the nanowires together. Using a single layer of this structure, the researchers produced an open-circuit voltage of 2.03 volts and a peak output power density of approximately 11 milliwatts per cubic centimeter. The above story is reprinted from materials provided by Georgia Institute of Technology Research News. The original article was written by John Toon.